I need to know the most economical place to buy a hyd. pump for my 446 Case garden tractor. Any help in this matter would be greatly aprieciated. Thanks in advance. Your best bet is to buy a kit to rebuild the pump. I'm wondering why the pump needs rebuilding and what type pump it is? Finding a kit could be a problem. My Ford repair manual says the pumps aren't serviceable and the parts manual doesn't have part numbers for internal parts. 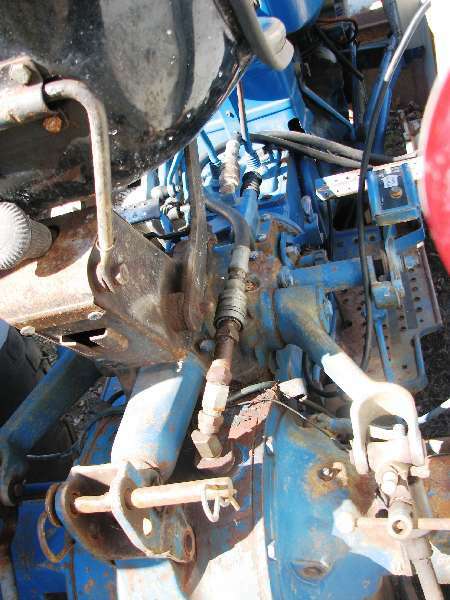 People with older farm tractors do talk about having pumps rebuilt, and the success of a rebuild may depend on the problem and pump type. My pump is a gear type and that's the most common type used on compact tractors. A rebuilding problem for gear pumps is that the seal between the housing and gears has to be close for the pump to withstand high pressures, but the housing wears over time. Just replacing the gears on a old pump may not restore adequate performance. I don't know if typical pumps on compacts use pressure plate seals for the gear to housing seal or if these are replaceable but that's a rebuild possibility. Bushings, drive gears etc. probably are available or could be made by a machinist. I suspect that just replacing the bushings on an old pump may make its efficiency worst instead of better. High pressure forces the gears against the housing to create the seal. New bushings would likely hold the gears further from a worn housing. Sounds like a good outcome. Take care on that new speedy tractor and don't let it throw you. If a relief valve is part of the new pump, you might think through an idea if the new pressures are appropriate for the old TX. I also own a 1988 446 Ingersoll with the seals out of the pump. The shop tells me it's $300 labor to replace the seals. Is it worth it? Tough to say. I'd think in terms of what the alternatives cost. One alternative might be buying manuals and parts for a do it yourself try. I tend to want to keep my old stuff going because patched up old stuff tends to out last new box store quality replacements. However, I might have to give up on an old snow blower. Even if I can find replacement fan shaft bearings, the engine compression tells me that I'd be throwing new drive parts in the face of an engine that's going to demand attention pretty soon. I think it needs placement in a home for retired equipment. Well maybe since the tractor blower does most of the work the walk-behind already has a retirement home and is now reduced to arguing for space in the garage. I would like to ask anybody to answer this for me. My tractor is working slowly. /.//646/// It doesn't work in high gear in the rear. In low it will work but not go up steep hills. The loader is slow with no real power. A new pump was put in before I got it. A 15 gpm from nothern. Does anybody have any answers. Does the new pump have a control valve too. Thank you. Any help would be appreciated. I don't know the tractor but it sounds like it has a HST and a pto pump for the loader. I don't know if the tractor has always worked that way since you've had it. The only think I can think of that might connect the two problems is if the pump/loader isn't connected right any it's always running against relief pressure load. If that's the case then you might disengage the pto and see if that improves power. I'd also ensure that the brakes aren't dragging. I have a case 646 loader. Everything works , but slowly. If anyone has any ideas please tell me. Thank you. I already tried the control valve underneath. It seems not to be that. If anyone had evere remedied this I would appreciate some input. Thank you all.